Now that you have formed your pirating identity, it is time to study the history of those before you. This is essential so that you can steal their ideas, learn from their mistakes, and end up stronger - and hopefully alive for longer - than those before you. The world of piracy is filled with uncertainty, adventure, guessing, and luck, and understanding the roots of piracy will help make sure you are the last pirate standing. Piracy began thousands of years ago in and around the Aegean and Mediterranean Sea. Many pirates from many different countries would sail the seas stealing from other ships. Some of these pirates had agreements with their home countries to share their wealth and not be caught, while others did not agree with any country and took host on the Barbary Coast. These pirates came to be known as the Barbary Pirates and were exceptionally merciless to those they encountered. Eventually France grew tired of all of their stolen goods and sent their navy to chase them away and the pirates went to live on the island of Hispaniola in the Caribbean. 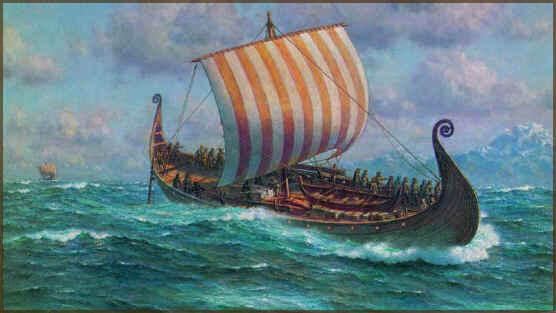 In addition to the Mediterranean pirates, the Vikings were another pirating group from the earliest recorded piracy times.These Vikings were highly feared by most countries as they were called “poets, storytellers, ruthless conquerors, explorers, plunderers and barbarians.” They travelled on a long, thin ship, appropriately called the longship, and it was driven by either sail, wind, or slaves rowing when they needed to move quickly. Vikings were found in Sweden, Norway, and Denmark and were incredibly powerful from the eighth through eleventh centuries. ​The Barbary States consist of Morocco, Algeria, Tunisia and Tripoli. They are located on the north coast of Africa between the Mediterranean Sea and the Sahara Desert. The Barbary Corsairs were a close group of men sailing out of their North African ports. These pirates created their own empire called the Barbary States. In this empire they established a government that was used to control the pirates who lived there. The two Barbarossa brothers were two of the most famous Barbary corsairs. They struck a deal with the sultan of Tunisia to let them build a pirate headquarters there and in return paid him a fifth of everything they captured. The Barbary Corsairs were a strong group of pirates that constantly terrorized the merchants around them to the point that merchant ships eventually started adding cannons to their ships. Eventually in 1830 France captured the Barbary corsair bases, which finally put an end to these pirates reign in the Mediterranean Sea. Some of these pirates left the Barbary corsairs and went to the West Indies to set up a base in Haiti. They became part of a group called the buccaneers and started to sail the waters of the Caribbean once more as pirates. There was even a strong force of piracy in the Pacific and Indian Ocean. In particular, these pirates sailed closest to Japan and India. Not a lot was documented about these pirates though other than that there was a highly popular pirate refuge on the island of Formosa until the 17th century. The Golden Age for Pirates began when Queen Elizabeth of England made her best sailors privateers. She gave them permission to plunder and loot in the honor of England, which backfired when the privateers realized how easy it was to be a pirate and how much money they would earn in doing so. Sir John Hawkins, Sir Walter Raleigh, Sir Francis Drake, and Captain William Kidd were all original privateers under the Queen that switched to being completely pirates. Later in this time period, buccaneers from the West Indies began to start stealing from any ship they found in the Caribbean Sea. This has been often from the Spanish Navy, whom they started to fight with fiercely. The Spanish Navy began destroying pirate ships and towns and would kill any buccaneer they caught. This made the buccaneers vow to fight the Spanish until the last man was standing in their newly formed group The Brethren of the Coast. The most successful buccaneer during this time period was Sir Henry Morgan. He began plundering at a young age in the Spanish settlements of Puerto del Principe, Puerto Bello, and Maracaibo. Captain Morgan completely destroyed the city of Panama in 1671 and took all of their valuable goods in the process. Buccaneers were continually popular until the war of Spanish Succession in 1701. The pirates stopped capturing ships and went to war with France and England again Spain. After this war was over though they once again resumed attacking Spanish fleets of treasure ships. This was when treasure hunting pirates because increasingly popular. Pirate Henry Jennings heard of a fallen treasure ship The Plate Fleet off of the tip of Florida and sailed over to capture the ship and all of its fallen treasure. The Golden Age of piracy ended in the early eighteenth century when a British Captain Woodes Rogers went out on a mission to defeat the pirates. He tricked them by trapping them in their own harbor. Over a thousand pirates resided at New Providence in the Bahamas, and he cornered them in there for battle. In the end Captain Rogers defeated the pirates and piracy never grew back to its original strength as a result.